Scientific and Technological Advanced Research Laboratories (S.T.A.R. Labs) is a fictional scientific research facility and organization appearing in American comic books published by DC Comics. It first appeared in Superman #246 (December 1971) and was created by Cary Bates and Rich Buckler. Superheroes receive treatment at the labs. S.T.A.R. Labs was introduced in Superman #246 (December 1971). In the Superman comics, Professor Hamilton formerly worked there, and Dr. Kitty Faulkner, also known as the superheroine Rampage, is currently employed there. The Metropolis location is featured in a battle and as a plot point in Armageddon 2001. In Teen Titans, Cyborg's parents, Silas and Eleanor Stone, and his former love interest, Dr. Sarah Charles, all worked for S.T.A.R. Labs. Past S.T.A.R. Labs employees are Murray Takamoto, Dr. Jenet Klyburn, and Dr. Albert Michaels (the first Atomic Skull). The 1993 comics miniseries S.T.A.R. Corps was about a group of superhumans who had inadvertently gained their powers in a S.T.A.R. Labs experiment. The labs are featured in the 1996 mini-series The Final Night. As eternal winter threatens the world, thanks to the Sun-Eater, S.T.A.R. Labs keeps their webpage updated with encouragement and various information related to the emergency. The San Francisco and Montana branches play an important role in the arc in Justice League of America #110–114 (2005). 52 Aftermath: The Four Horsemen #1 (October 2007) shows a S.T.A.R. Labs relief operation working, side by side with Waynetech, in the devastated remains of the country of Bialya. All the relief workers are slain by outside forces. The latter few issues of DC Universe: Legacies showcases the life of Metropolis Star Labs security director Jim M.
S.T.A.R. was founded by scientist Garrison Slate, who wanted a nationwide chain of research laboratories unconnected to the government or any business interests. He succeeded not only on a national scale, but an international one as well: S.T.A.R. Labs currently maintains facilities in Canada, Europe, Australia, and Japan as well as in the United States, with the total number of facilities numbering between twenty and thirty at last recorded count. S.T.A.R. Labs is one of the companies providing sponsorship to the superhero team The Conglomerate. The other sponsors included American Steel, Dante Foods, Dupree Chemical, Ferris Aircraft, LexCorp, Ovel Oil, Pax Entertainment, Stagg Enterprises. S.T.A.R. 's Detroit location assists in evacuation efforts of the world's coasts during an alien invasion. Detroit, Michigan: specialized in physics research. Closed down in 2004. New facility seen in 2017. New York City, New York: specializing in research and technology. Destroyed in explosion. Seattle, Washington: specializing in studying psychology and psionics. S.T.A.R. Labs is shown in the Superman episode "The Hunter." S.T.A.R. Labs is mentioned in an episode of Batman: The Animated Series. In Superman: The Animated Series, S.T.A.R. Labs and scientist Professor Hamilton made regular appearances as a source of information and equipment for Superman. In addition to housing Kryptonite rocks under lock and key, S.T.A.R. custodian Rudy Jones was transformed into the monstrous Parasite during an attempt to steal hazardous materials. The episode "Two's a Crowd" featured a scientist named Earl Garver who stole isotopes which he made into a bomb until he was stopped by Superman. S.T.A.R. Labs made appearances in Justice League Unlimited. S.T.A.R. Labs was also mentioned in the Teen Titans cartoon, as the makers of the "Maximum 7", a microchip Cyborg uses to upgrade himself in the episode "Overdrive". S.T.A.R. Labs is also featured in the animated series Krypto the Superdog; it has an unintentional hand in creating Stretch-O-Mutt. A van that has "S.T.A.R. LABS" written on it can be seen at the end of the Batman: The Brave and the Bold episode "Invasion of the Secret Santas." Masked men from S.T.A.R. Labs are loading the remains of Red Tornado into it to be repaired. In "The Color of Revenge," an S.T.A.R. Labs facility in Bludhaven is later attacked by Crazy Quilt when he comes to steal the Stimulated Emission Light Amplifier. A group of bound and gagged S.T.A.R. scientists briefly appear, but have no lines. A S.T.A.R. Labs facility appears in the Young Justice episode "Infiltrator". The facility is raided and destroyed by the Swarm, a cloud of dangerous nanites used by the League of Shadows. In "Misplaced," Klarion the Witch Boy, Wotan, Blackbriar Thorn, Felix Faust and Wizard's spell that split the Earth into the kids dimension and the adults dimension enabled a diversion for Riddler and Sportsmaster to steal an organism (which resembles a part of Starro) from S.T.A.R. Labs. It is brought before Brain during his meeting with the other members of The Light (Project Cadmus' Board of Directors) as Brain tells Klarion the Witch Boy that they plan to bring it "into the Light." The only know members of S.T.A.R. Labs in this continuity are Adam Strange and Eduardo Dorado. In the 1990 series The Flash, Dr. Christina "Tina" McGee (Amanda Pays), the scientist who helps Barry Allen (John Wesley Shipp) deal with the super-speed that makes him The Flash, works for S.T.A.R. Labs in Central City. In Lois & Clark: The New Adventures of Superman, S.T.A.R. Labs was often mentioned as a source of scientific information. It gained more prominence with the introduction of S.T.A.R. scientist Dr. Bernard Klein as a recurring character from the third season onwards. Dallas City Hall doubles as S.T.A.R. Labs' building exterior for long shots during the series. In Smallville, Winslow Schott is a scientific inventor of S.T.A.R. Labs who was hired by Oliver Queen to work for Queen Industries. It is later revealed that S.T.A.R. Labs was founded by Virgil Swann. S.T.A.R. Labs is also run by Dr. Emil Hamilton who took over Dr. Virgil Swann place to help Superman's powers and his origin. S.T.A.R. Labs appears as a major location in the Arrowverse. It is first mentioned in the second season of Arrow during the episode "Three Ghosts" when Barry Allen (Grant Gustin), having helped Oliver Queen thwart one of Sebastian Blood's schemes in Starling City, returns to his home of Central City, only to be simultaneously hit by both lightning and an explosion caused by the meltdown of S.T.A.R. Labs's particle accelerator and rendered comatose for nine months. Later, in "The Man Under the Hood," S.T.A.R. scientists Caitlin Snow (Danielle Panabaker) and Cisco Ramon (Carlos Valdes) are recruited by Felicity Smoak (Emily Bett Rickards) to synthesize a cure to Mirakuru drug using a blood sample. The villain Deathstroke (Manu Bennett) also attacks S.T.A.R. Labs in the same episode on the hunt for some equipment. S.T.A.R. Labs returns in the 2014 series The Flash. Following the events of the second season of Arrow, Barry awakens from his coma and learns that he has gained super speed. He joins forces with Caitlin, Cisco, S.T.A.R. founder Harrison Wells (Tom Cavanagh), and his adoptive father Joe West (Jesse L. Martin) to combat individuals who were also affected by the particle accelerator explosion (dubbed metahumans) but are using their newfound abilities for nefarious purposes, using S.T.A.R. Labs as a primary base of operations and reappropriating the old particle accelerator as a makeshift prison for them. It is revealed throughout the events of the first season that Eobard Thawne (Cavanagh/Matt Letscher), who had been masquerading as Wells, had engineered the explosion to give Barry his powers and groomed him into becoming the Flash in order to use Barry to return to his original time in the future. In the second season, Barry, having defeated Eobard, is given ownership of S.T.A.R. Labs by Eobard through his will. However, Team Flash discover that a breach to parallel worlds has appeared in S.T.A.R. Labs as a result of the events of the first season, and through it they meet Jay Garrick (Teddy Sears) and a second Harrison Wells, who have come to stop the villainous Zoom, a murderous speedster from their world (dubbed "Earth-2") who plans to steal Barry's speed for himself. The second season also introduces the S.T.A.R. Labs of Earth-2, which was also responsible for creating metahumans. Wells, Barry and Cisco briefly reside there with the intention of closing the breaches between the two Earths in order to trap Zoom in Earth-2, but they are forced to evacuate when Zoom attacks the building. The third season introduces a new room called the "Speed Lab", an exercise chamber for Barry and other speedsters that was created as a result of Barry creating a new timeline. It also introduces a third S.T.A.R. Labs on Earth-19 whose Harrison Wells is recruited by the team. Unlike the S.T.A.R. Labs of other Earths, however, its leading scientific mind is not Wells but instead his partner, Randolf Morgan (Adam Bergquist), whose work Wells often claims credit for. During his time on Earth-1 the Wells from Earth-19 begins the process of turning S.T.A.R. Labs into a museum. In a flashback of season 5 episode "The Death of Vibe", it is shown that between 2018 and 2024, the Flash Museum will be inaugurated in the same building as the S.T.A.R. Labs, with Mr. Myles becoming it's curator. S.T.A.R. Labs makes multiple appearances in the 2019 series Doom Patrol. S.T.A.R. Labs makes an appearance in Justice League: Doom. After Superman is shot by a Kryptonite bullet, the Flash is sent to a S.T.A.R. Labs facility in Kyoto, Japan, where they are making a Kryptonite scalpel (this being the only tool that could allow doctors to operate and remove the bullet). The scalpel ends up being unnecessary, as Batman has Cyborg use his blaster filtered through a piece of Kryptonite crystal to serve as a cutting laser and Martian Manhunter uses his shape-shifting abilities to remove the bullet. In Justice League: The Flashpoint Paradox, Superman tells Batman & Flash that he will take Professor Zoom to S.T.A.R. Labs after they successfully remove Zoom's 25th century bombs off the Rogues. However, this version of S.T.A.R Labs appears to be in the Watchtower after Superman is seen taking Professor Zoom towards the sky. S.T.A.R. Labs first makes an appearance in Justice League: War when Victor Stone goes there after a football game to confront his father as to his absence during the game. Captain Marvel later returns several Parademons to S.T.A.R Labs through the whole in the roof shortly after the creation of Cyborg. It is shown again at the end of the movie while it is under-repair. S.T.A.R. Labs makes several appearances in Justice League: Throne of Atlantis where it is being used as a headquarters for the Justice League albeit with the group's original name The Super Seven much to Steve Trevor's annoyance. This is later corrected at the end of the movie with the name Justice League above the HQ Doors. S.T.A.R. Labs appears in Teen Titans Go! To the Movies. Slade infiltrates into the laboratory to steal the Kryptonian crystal. While the Teen Titans try to stop Slade, he easily escapes because the Titans aren't serious enough. In Man of Steel, S.T.A.R. Labs has several cameo appearances through the film. In Batman v Superman: Dawn of Justice, S.T.A.R. Labs appears in video obtained by Bruce Wayne from a LexCorp drive and emailed to Diana Prince. In the Ultimate Edition, Jena Malone appears as Jenet Klyburn in a separate role as a weapons expert and ballistics specialist. S.T.A.R. Labs appears once again in Justice League. Silas Stone, Cyborg's father, is S.T.A.R. Labs' head and the lead scientist conducting the research on the crashed Kryptonian ship, as well as the research on the Mother Box kept by mankind. Silas and other S.T.A.R. Labs personnel are kidnapped by the film's villain, Steppenwolf, and later rescued. In the end of the film, Silas continues helping his son to understand and master the alien technology of his body at a S.T.A.R. Labs facility. S.T.A.R. Labs is featured in the video game Justice League Heroes. Superman and Batman travel to S.T.A.R. Labs to fight Brainiac and his robotic minions. After Brainiac is defeated, Superman and Batman discover it is only a clone of Brainiac. S.T.A.R. Labs is featured in DC Universe Online. In the hero campaign, the players can gain the trust of S.T.A.R. Lab's personnel by completing certain missions, collecting specific bounties, and gain access to equipment from S.T.A.R. Labs Vendors. An old S.T.A.R. Labs building can be seen in Downtown Metropolis, where villainous players are enlisted to help Gorilla Grodd reclaim his technology confiscated by S.T.A.R. Labs troops and defeat both the original Flash and the current Flash. There is also a S.T.A.R. Labs building in the Otisburg section of Gotham City. S.T.A.R. Labs' soldiers consist of S.T.A.R. Labs Heavy Troopers, S.T.A.R. Labs Security Guards, and S.T.A.R. Labs Shock Troopers. Injustice: Gods Among Us has a stage titled Insurgency, which is inspired by S.T.A.R. Labs' facilities and is used by Batman. A section of the game called "S.T.A.R. Labs Missions" is present. S.T.A.R. Labs have a cameo appearance in DC Super Hero Girls. Atomic Skull is the name of two different DC Comics supervillains, both of whom are foes of Superman. Cicada (David Hersch) is a fictional DC Comics supervillain. Note that the numbering goes from northwest to southeast:Centennial Hotel - Offers world-class cuisine and an observation deck with views across Centennial Park. Centennial Park - Activities in the wooded acres include horseback riding, boating, and golfing. 1938 Sullivan - Owned by Wayne Enterprises, Lois Lane and Clark Kent's apartment building is one of the city's oldest buildings. University of Metropolis - Clark Kent's alma mater, this Ivy League institution boasts well-respected schools of journalism, law, and business. S.T.A.R. Labs - The Metropolis arm of the privately owned scientific think-tank founded by Dr. Garrison Slate. Steelworks - John Henry Irons' foundry in the Old Hook Basin district of Suicide Slum includes a variety of advanced technology to aid Superman. Suicide Slum - Despite being razed and renovated by Brainiac 13, Suicide Slum, where Bibbo has his Ace O' Clubs bar, is still a sink of crime and poverty. Special Crimes Unit Precinct - Metropolis' S.C.U's upgraded headquarters houses offices, armories, and holding cells. Stryker's Island Penitentiary - The ultimate maximum security prison possesses high-tech detention facilities designed to accommodate the most powerful metahuman villains. Union Station - Location in the heart of the city, Union Station links the national railroad network to Metropolis' unique "Rail Whale" commuter grid. Metropolis City Hospital - The state-of-the-art medical center maintains a privileges-sharing program with S.T.A.R. Labs. Jules Verne Extra-Terrestrial Museum - The museum exhibits artifacts from alien worlds and presents guest lectures by interplanetary heroes. Lena Luthor Science Explorarium - Technological advances abound this interactive museum. City Hall - The administrative center of Metropolis has mayoral, governmental, and emergency services offices. S.A.I. Dam - Hydroelectric waterworks control the flow of the twin rivers and the recycling of the city reservoir. Hypersector - The business and financial center of Metropolis. Hotel Metropolis - Five-star luxury accommodation located amid the heart of Downtown. Shuster Hall - Metropolis' premier theater has been in service since 1938. GBS Building - The corporate hub of Galaxy Communications' media conglomerate. Daily Planet Building - The home of the respected, globally circulated newspaper. The Daily Planet Building, with its distinctive hologram globe, is one of the city's most important landmarks. Metropolis Museum of Art - Galleries include important historical and contemporary artistic works. 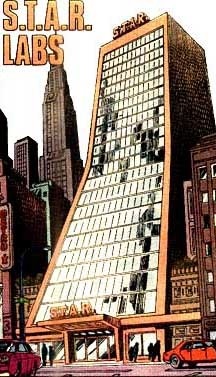 LexCorp Towers - Designed to form a double L, Lex Luthor's 307-story citadels (with robot sentries and mutable glass windows) are Metropolis tallest skyscraper. The Power Company was a team of professional superheroes-for-hire in the DC Comics universe. The team, created by Kurt Busiek and Tom Grummett, first appeared in JLA #61 (February 2002). They subsequently starred in an epoynmous series that ran for eighteen issues, from April 2002 to September 2003, also written by Busiek. S.T.A.R. Corps is a fictional organization, a team of comic book superheroes published by DC Comics. The S.T.A.R. Corps first appeared in S.T.A.R. Corps #1 (November 1993), and was created by Dan Vado and Norman Felchle. The Flash is a 1990 American television series developed by the writing team of Danny Bilson and Paul De Meo that aired on CBS. It is based on the DC Comics character Barry Allen / Flash, a costumed superhero crime-fighter with the power to move at superhuman speeds. The Flash starred John Wesley Shipp as Allen, along with Amanda Pays, and Alex Désert. The first season of the American television series The Flash premiered on The CW on October 7, 2014 and concluded on May 19, 2015 after airing 23 episodes. The series is based on the DC Comics character Barry Allen / Flash, a costumed superhero crime-fighter with the power to move at superhuman speeds. It is a spin-off from Arrow, existing in the same fictional universe, and was produced by Berlanti Productions, Warner Bros. Television, and DC Entertainment, with Andrew Kreisberg serving as showrunner. The series follows Allen, portrayed by Grant Gustin, a crime scene investigator who gains super-human speed, which he uses to fight criminals, including others who have also gained superhuman abilities. Gustin is joined by main cast members Candice Patton, Danielle Panabaker, Rick Cosnett, Carlos Valdes, Tom Cavanagh, and Jesse L. Martin. The Flash was picked up for a full season by The CW in October 2014, and filming took place primarily in Vancouver, British Columbia, Canada. The series premiere was watched by 4.8 million viewers and had a 1.9 18–49 demographic rating, making it The CW's most watched and highest rated series premiere since The Vampire Diaries in 2009. It also became The CW's second-most watched series premiere ever, behind 90210, and the third-highest rated in the 18–49 demographic. The first season finished as the 118th ranked show, with an average viewership of 4.62 million, making it the most watched series ever on The CW, and also the highest rated series among men 18–49 and men 18+ ever on the network. The first season of The Flash received generally positive reviews from critics. Reviews for the series became increasingly positive as the season progressed, with the finale receiving critical acclaim. The series was renewed for a second season on January 11, 2015. Thunder and Lightning are a duo of superpowered brothers published by DC Comics that had encounters with the Teen Titans. They are not to be confused with the two superheroines Thunder and Lightning, sisters introduced at different times who are the daughters of Black Lightning. Valerie Perez is a fictional character, a DC Comics supporting character and love interest for Bart Allen when Bart was the Flash.